The Lachman test is a commonly used clinical test for evaluating anterior cruciate ligament (ACL) integrity. When performing the Lachman test we have noted an additional, previously unreported finding, which helps to discriminate between the intact and ruptured ACL. This observation, which we have named the lift-off sign, can be explained using the different classes of lever system operating in each case. We believe that we have noted an additional examination finding which helps to diminish that doubt and confirm the diagnosis of ACL rupture when performing the Lachman test. When performing the Lachman test on patients with an intact ACL, we have noted that the patient's heel is lifted off the table by the anterior translational force applied to the tibia. However, in patients with complete ACL rupture, the patient's heel remains on the examination table despite the same anterior translation force being applied. The explanation of this phenomenon is straightforward when the lever systems and moments involved in each case are considered. With an intact ACL, excessive anterior translation of the tibia is prevented by tension in the ligament and, when taut, the tibial insertion of the ACL effectively acts as a fulcrum. If the moment generated around this fulcrum by the anterior pull of the examiner's hand overcomes the opposite moment produced by the weight of the leg, the foot is lifted off the table (Figure 1A). 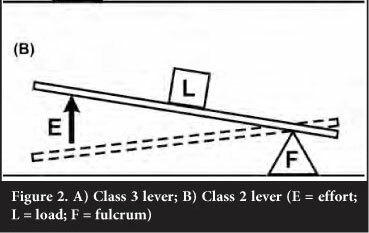 The result is a class 3 lever system (Figure 2A). Following ACL rupture, the tibial insertion of the ACL can no longer function as a fulcrum and therefore anterior translation of the tibia is relatively unrestricted. 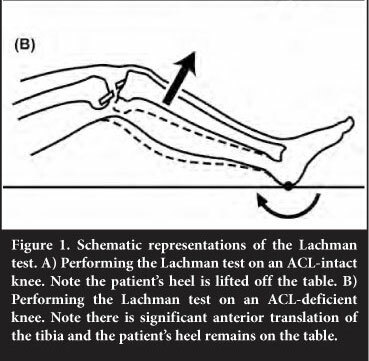 (The ACL has been found to provide 86% of the resistance to anterior translation of the tibia.5) When performing the Lachman test on an ACL-deficient knee, the patient's heel acts as the primary fulcrum and the anterior pull of the examiner's hand produces anterior translation of the tibia and rotation around the heel; there is no significant moment to lift the patient's foot off the table (Figure 1B). The result is a class 2 lever system (Figure 2B). In the acutely injured knee, where manual examination may be limited by pain, a similar phenomenon can be observed using the 'no touch' ACL test previously described by the senior author.6 Using this technique, the patient is placed supine with the injured knee flexed and bolstered at approximately 30°. While the examiner observes the lateral aspect of the knee, the patient is instructed to raise the heel off the examination table by flexing the quadriceps and extending the knee. If there is an isolated rupture of the anterior cruciate ligament, the tibial plateau will gently subluxate forward on the femoral condyle as extension is initiated while the heel remains on the table. Even more pronounced will be the posterior reduction of the tibial plateau after the heel is replaced on the table and the patient relaxes the quadriceps. We recognise that, if a large enough sustained force is applied during the Lachman test, the foot can be lifted off the table by pulling the proximal tibia anteriorly even in the absence of an intact ACL. However, it is not until the secondary restraints to anterior translation become taut, and after significant displacement, that the proximal fulcrum can become effective again. This displacement should be readily observed as a positive Lachman test well before the foot leaves the bed. Although the biomechanical principles of the lift-off sign are sound, the interpretation of this sign is subject to patient and examiner factors. In our experience, demonstration of the lift-off sign and its corollary is reliable and reproducible when the ACL is completely intact and completely torn, respectively. However, the lift-off sign is likely to be less accurate in cases of partial ACL tears and other concomitant knee injuries. The authors intend to address this with future research to investigate the sensitivity and specificity of the lift-off sign by comparing physical examination findings with magnetic resonance imaging and arthroscopic results in patients with suspected ACL injury. Until such formal scientific investigation is completed, we believe that this description of the lift-off sign can not only aid clinicians in the diagnosis of ACL injury, but that demonstration of the lift-off sign may enhance students' comprehension of ACL anatomy and mechanics. In summary, we have noted that, when performing the Lachman test in the presence of an intact ACL, the patient's foot tends to lift off the table, while with a ruptured ACL it remains on the table. This observation, which we have named the lift-off sign, is explained by a difference in the lever systems operating in each case and may aid in the diagnosis of ACL injury.